Q: I am facing a blooming problem of Erucamide (Er) from an elastomer, additive content is around 0.15 - 0.20%. The more I add, the shorter the period of time Er comes out! Is it an illusion to achieve a "non-blooming mold release agent"? A: Erucamide is traditionally used as a slip in polymer films and the methodology is that the best slips are those least compatible with the polymer, so they will migrate out to the surface and act as a slip agent. I recommend you contact your additive supplier and let them know the materials and your needs and they can advise you what would work best as a mold release agent for your application. If you desire less blooming, either choose a non-blooming product or a poorer performer for your base resin, which would be one that blooms less. Your additive supplier is the best source for choosing the correct product for your application. Blooming effects with fatty acid amids are common (more with oleamides though). The 1500 - 2000 ppm level you are using is quite high and defined to provide a very good slip effect. The functionality is to migrate with this additive class. The additive is soluble in the amorphous melt and literally squeezed out upon cooling of the melt. The less crystalline the morphology is, the faster the migration. The additive continues to migrate (through the amorphous domains) and this effect may cause sub-sequent blooming problems. 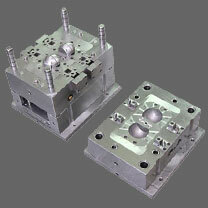 The blooming may be somewhat effected by molding temperature and the lower you mold, the slower the migration will be. The migration will speed up if you can allow your parts to be slightly heated up after the molding. In 50-60 degrees C, the migration will be quite faster. You may also like to evaluate a mix of oleamide and erucamide at a 1:1 ratio and say about 1000 ppm. The oleamide will be quicker to migrate than the Er and the Er will pick up a bit later.